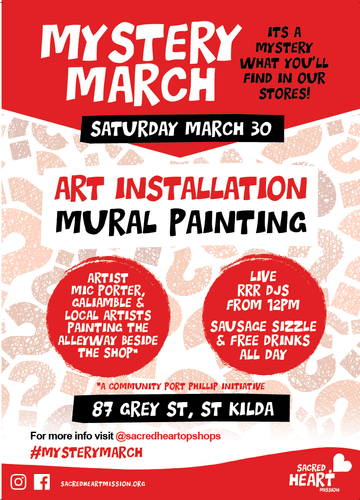 Our St Kilda store's adjoining alleyway becomes a canvas with a live mural painting experience. Local artists, led my Mic Porter and Galiamble transform the old, dilapidated alleyway, which serves as a major donation point for the op shop, into a community inspired work of art. Sausage sizzle, drinks and Triple R FM DJs in store.